As winter sports came to an end, the track season began. The track team’s first meet was on March 29 at Silver Lake, where the junior varsity girls team won the meet, the boys JV team placed second and the girls varsity team earned third. From last year’s state qualifiers, only senior Zane Roberts returns to the team, as alumna Holly Forrester graduated. Returning coach Mike Zabel and the team have also added a new high jump coach Shauna Churchman. While Zabel said he believes that last season went pretty well, this season he expects everyone to improve on their events. Freshman Grace Fike has been competing in track for five years inside and outside of school, and this year will be her sixth. Fike participates in long jump, triple jump, 300-meter hurdles, 100-meter hurdles and 4×400-meter relay. 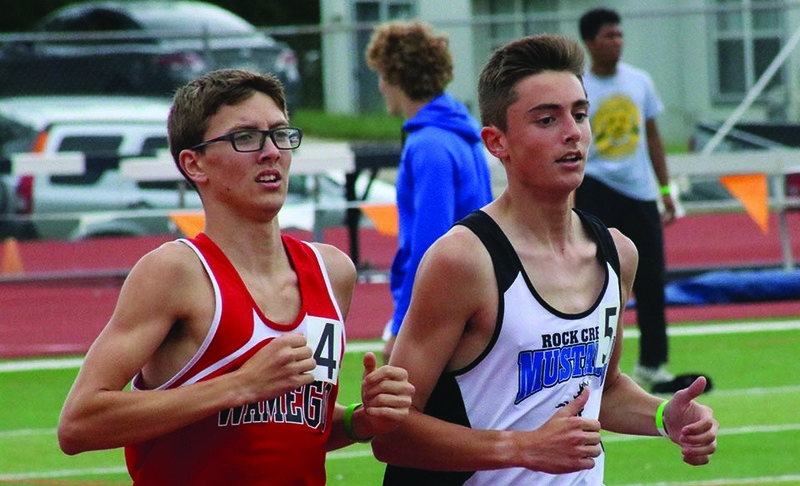 Sophomore Nolan Churchman has been competing in track for four years and participates in long jump, high jump, the 4×400-meter relay and is a substitute for the 4×100-meter team. Churchman said he believes that he will be improving on high jump a lot throughout the season and is looking forward to doing long jump since he did not compete in it before. Senior Kacy Turnbull has been competing in track for five years and this year will be her sixth. Turnbull competes in high jump and runs winter track. Rock Creek’s JV track team will have a meet at Abilene on April 10.